Experience the nostalgia and charm of bygone days with modern comfort and luxury in our bespoke Shepherds Hut and River Keepers Hut, nestled on the South Downs Way in Pyecombe on the outskirts of Brighton. We offer direct access onto the beautiful South Downs walkways and are adjacent to the famous Jack and Jill Windmills, just a 10 minute walk away! Waydown Cottage has been our home for nearly 21 years. Set in four unspoiled acres, we are surrounded by a beautiful wood with our only neighbours being the Jack and Jill Windmills, Pyecombe Golf Course and the Three Greys Stables. However we have the benefit of superb facilities within a few minute’s walk including Marks and Spencer’s Simply Foods at the local Garage 2 minutes’ drive or 10 minutes’ walk away. The local village pub, The Plough, offers a wonderful choice of cuisine and fine wines in their conservatory restaurant, or enjoy a beer or glass of wine with a choice of snacks in the bar. They also provide a take away service. Hassocks is our local village with all the usual range of shops and a selection of eateries and the railways station is on the main London to Brighton line, the historic Town of Lewes in 15 minute’s drive away, with cosmopolitan Brighton 15 minutes away. For those wishing to visit London, it is a 90 minute drive or 60 minute train ride. 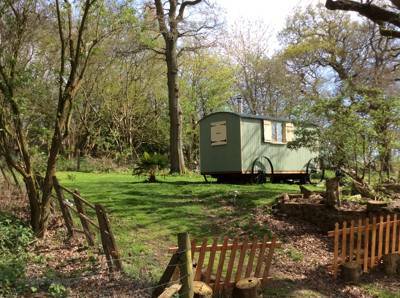 For latest availability and best prices for Waydown Shepherds Huts, please use the Date Search above. 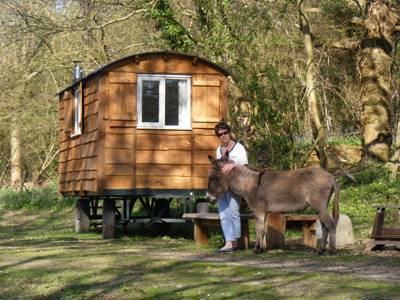 The Woodkeepers Hut (sleeps 4) has a large double bed and bunk beds (all bedding and towels provided). There is power, lighting and heating plus a wood burning stove with logs. Outside private garden with seating, BBQ and firepit. Tea and coffee facilities provided. Flowers and homemade cakes are in the hut on your arrival. There is a large shower hut, a separate toilet with wash basin and a communal kitchen hut with a dual-ring gas cooker, microwave, fridge, toaster, kettle, radio, sink and a breakfast bar. Cutlery, crockery, pots and pans are all provided. There are a pair of very playful donkeys in a field adjacent to the huts (called Nancy and baby Dudley). It's super easy to join the South Downs Way – the most popular starting point for anyone exploring the area. Stretch yourself with the walk up to Ditchling Beacon (take a bike if you have the energy) – the views are well worth the effort. Or if you'd prefer to explore by horse, the 3 Greys Riding School opposite Waydown offer hacks and lessons (01273 843536) for adults and children. The nearby village itself boasts a small but beautiful museum (01273 844744), a good pub and a nice tea room (see Food & Drink). Further afield, the beautiful county town of Lewes deserves your time, with its prominent hilltop castle (01273 486290) and wonderful Georgian buildings, while the bright lights of Brighton, on the south coast, are 8 miles away. The bohemian town's famous pier (01273 609361), beach and collection of galleries, theatres and bars make it a worthwhile day trip during longer stays. 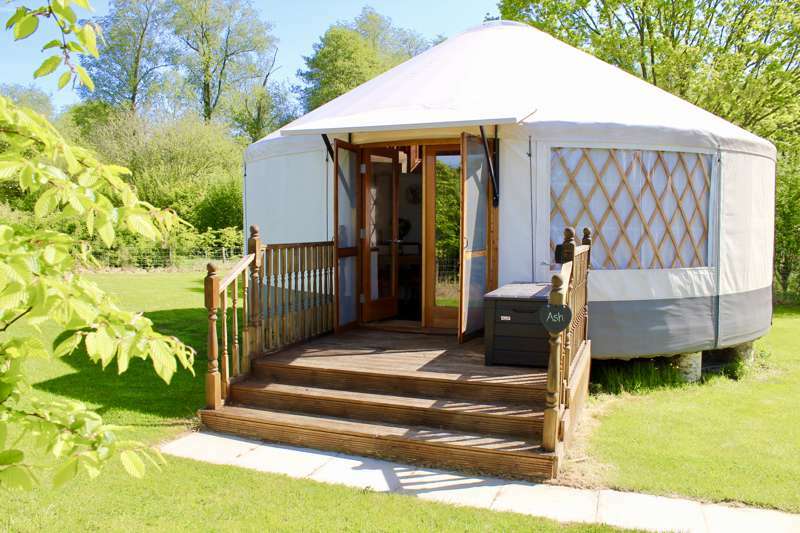 There are 3 good pubs within a 5-minute drive or 15-minute walk from the glamping site. The furthest – The Ginger Fox (01273 857888) – is particularly good, with excellent gastro pub food, a large beer garden with a children's playground and dogs welcome, but for the closest option The Plough Inn (01273 842796) is still a great choice. Also the Jack & Jill Inn (01273 843595) in Clayton offers great home-cooked pub grub with dogs welcome. 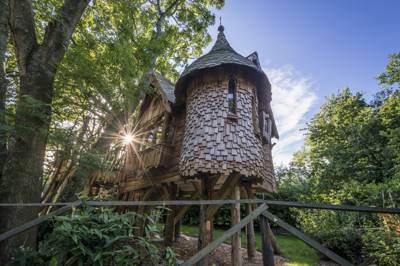 It can be walked in 20 minutes through woodlands or 3 minutes by car. Wayfield Park Farm Shop (07742 082051) is also just down the road, offering delicious home-cooked breakfast and lunch (available Tuesday–Sunday; dogs welcome). For everything else, pop to M&S Simply Foods at the local garage or drive into Hassocks (5-minute drive) where local shops include Sainsbury’s and Budgens, along with cafés, takeaways and more. There's also a nice little tea rooms (01273 842708) in the village of Ditchling – very walkable. Hassocks Railway Station (0845 748 4950) is a 5-minute drive away. It's on the main London-Brighton line with Brighton a 15 minutes journey and London taking little over an hour. 4 shepherd's huts (a pair sleeping 2 and a pair sleeping 4).